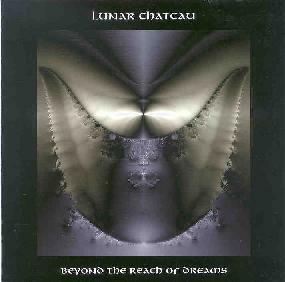 Lunar Chateau - "Beyond The Reach Of Dreams"
Lunar Chateau is a trio from Wisconsin who play a style of progressive rock that blends symphonic prog, New Age, and spacey ambience, but has a clear rhythmic sense as well. The band consists of the brothers Sekulovich: Novak on keyboards and vocals, Paul on bass and vocals, and Milo on drums. Beyond The Reach Of Dreams is the bands second CD, the first released in 1994 and also on Musea. The CD includes three short tracks and two in the ten minute range. "Olympus Mons" opens the set and is a basic symphonic progressive tune that was nice but didn't overly impress me. "Far From Home" is a solid song with very good vocals and overall bears a strong resemblance to Camel circa Breathless and The Single Factor. On "Consequences" the music starts to get more adventurous and interesting. Milo's measured and varied drumming sets the pace and joins Novak's keyboards in carrying the composition through multiple twists and turns. I like the darker atmosphere and the best parts are when the Phantom of the Opera styled organ plays its melody while the drums run through a parade of sounds that serve as much of an instrumental role as it does rhythmic. The music eventually develops into another Camel styled song, but as a whole the band covers a lot of ground in only six minutes. "Solange In Rio" further spotlights Milo's drumming as he seems to influence the music as much as Novak's keyboards. "Beyond The Reach Of Dreams" and "Zeta Reticuli" are the two extended multi-movement works on the CD. The title track is a 3-part piece that begins with a spacey orchestral intro. It slowly increases in volume and chanting female vocals add an ethereal, and maybe even a slight Celtic, quality to the atmosphere. After a few minutes things become quiet and the rush of ocean waves opens the next segment. Male vocals chant in a church-like style against a slightly spacey backdrop. It's a decent track, but "Zeta Reticuli" was the one that made me stand up and take notice. The vocals again recall Camel, though the music is heavily symphonic. Once the bass and drums kick in the band starts to rock out a bit and a difficult to describe blend of rock, New Age, and space covers the landscape. In true prog rock spirit the song evolves through three movements, all of which convey a heavenly spiritual feel. The final movement includes some of the most powerfully majestic music on the CD, and on the whole this is the strongest track. I really took note of the lyrics, and the bands web site discusses the songs theme: The title is named after a star system located 37 light-years from Earth, and the song itself explores UFO visits to Earth. In summary, I enjoyed Beyond The Reach Of Dreams, though I only found about half of it really memorable. Milo is a strong and capable drummer and I'd like to hear the band rock out a bit more as the prominent percussion segments were some of the most interesting and certainly the most potent. On the other hand, "Zeta Reticuli" shows that the band can also embark on a little cosmic exploration within the framework of their composed pieces. I'll look forward to hearing more from them. For more information you can visit the Lunar Chateau web site at: http://www.lunarchateau.com. Contact via snail mail c/o Lunar Chateau Worldwide; PO Box 510618; New Berlin, WI 53151. Beyond The Reach Of Dreams is distributed by Musea Records. You can visit their web site at: http://www.musearecords.com.